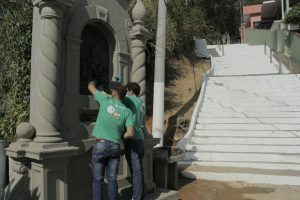 In coordination with the Ministry of Culture of the city of Santos, a clean-up of 122 monuments was carried out – granite niches that harbor bronze images narrating the Way of the Cross – along the 402 steps of the staircase of Mount Serrat. 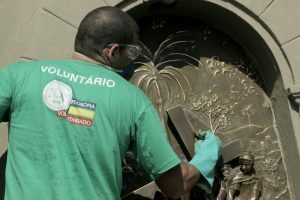 The objective of the Clio Project is to evaluate and preserve the historical memory of the city reflected in these works and to support their maintenance. March – Statue: Saturnus of Brito – Beach Garden, José Niño. April – Bust of Ariosto Guimarães – Historical Center. May – Statue: Vicente de Carvalho – Beach Garden, Boqueirão. 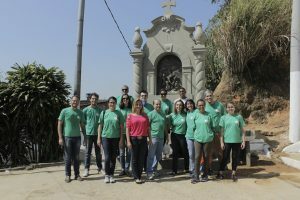 June ​​- Monument of Father Anchieta – Beach Garden, Punta de la Playa.